A platoon inspection was held today in order to celebrate the Finnish Independence Day. Afterwards the platoon attacked and successfully destroyed an enemy communications array despite heavy casualties. Ltn Psykoisi was promoted to Yliluutnantti (ylil). Kers Kuik was promoted to Ylikersantti (ylik). Kers Winters was promoted to Ylikersantti (ylik). Alik Raunhofer was promoted to Kersantti (kers). Korpr Charlie Frank was promoted to Alikersantti (alik). Aliks Karko, Sahuri and Jarger korprs Bruun, CZ, Hawk, Naatti, Nouty and Spinoza as well as stms Mika and Scottz were awarded with Kuntoisuusloma (KL) for exemplary service. Furthermore, maj Broileri, ylil Psykoisi, vääp Sami, kers Kegetys, kers Night, kers Raunhofer, alik Karko, korpr Bruun, korpr CZ, korpr Hammer, korpr Hawk, korpr Naatti, korpr Nouty, korpr Rölli, korpr Spinoza, korpr Strat, stm Anatooli, stm Haba, stm Sakinz and stm Scottz have been awarded with Operation Valhalla Service Ribbon for their active participation in the campaign fought in Chernarus from September to November 2012. Haba has been promoted to Sotamies (stm) and assigned to the 1st Squad as a Rifleman. Congratulations! A traditional squad meeting was held at Lake Konnevesi last weekend. Patrols were sent to reconnoitre both the forest-covered hills nearby and the deep waters adjacent. Later, cold beverages were had with hot food by a warm fire made to the lakeside in close to freezing temperatures, closely followed by vicious circle of a warm sauna and a cold lake. The mission was an overall success with surprisingly low casualties. Kapt Broileri was promoted to Majuri (maj). Ylik Sami was promoted to Vääpeli (vääp). In addition, Wolfskin, Ukkapukka, Broileri, Psykoisi, Sami, Jafarin, Kegetys, Kuokkanen, Sahuri, CZ, Naatti and Scottz were awarded with Talkootyön Ansiomitali (TA) for participating. Haba has been recruited to LDDK. Welcome! LDDK conducted combat operations last night on the island of Utes. The purpose of the operation was to eliminate Scud threat, destroy enemy air assets and finally eliminate the local warlord. After fierce fighting and severe casualties the operation was finally completed. Anatooli has been promoted to Sotamies (stm) and has been assigned to the 2nd Squad as a Rifleman. Anatooli has been recruited to the Detachment. Welcome! Sakinz has been promoted to Sotamies (stm) and assigned to the 1st Squad as a Rifleman. 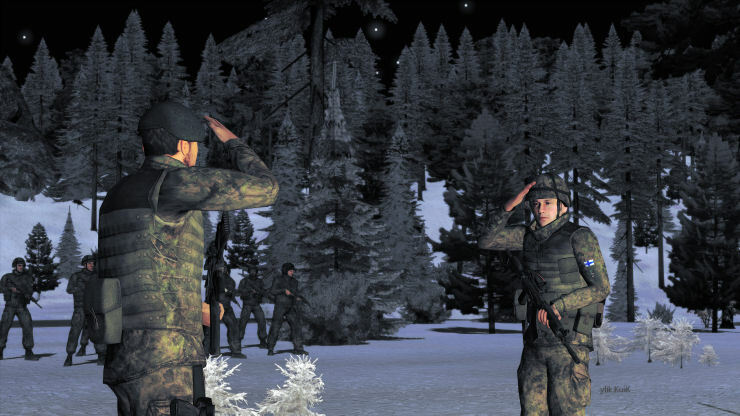 A platoon inspection was held on Monday in celebration of the Finnish Defence Forces Flag Day, or the 145th birthday of Field Marshal C. G. E. Mannerheim. Korpr Spinoza received the Ribbon with a Silver Wrench for continuing to provide the Detachment with high-quality missions. This was the first time for the decoration to be awarded. Korpr Jarger was promoted to Alikersantti (alik). Stm Choke was promoted to Korpraali (korpr). Stm Lufti was promoted to Korpraali (korpr). Stm Strat was promoted to Korpraali (korpr). Kers Kuokkanen for processing the detachmental reserve files. Alik Jarger for improving platoon training capabilities, among other matters. Alik Raunhofer for the Vehicle Identification Guide, among other matters. Korpr CZ for logistical support and exemplary service in the field. Korpr Rölli for the Vehicle Identification Guide and exemplary service in the field. Korpr Strat for bringing an improvement to the civilian dress code of the platoon and for meticuloulsy recording battles fought. Shortly after the ceremonies, the platoon attacked an enemy airport. While casualties were heavy, the mission was a decisive moral victory. Sakinz has been recruited to LDDK. Welcome! Scottz has been promoted to Sotamies (stm) and assigned to the MBT Squad as a tank crewman. Strat has been promoted to Sotamies (stm) and assigned to the 2nd Squad as a Machine Gunner. 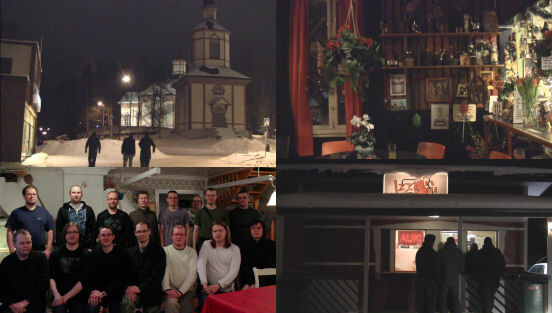 A squad meeting was organised last weekend in Kannus, Central Ostrobothnia. The friendly people of the small town with e.g. the first public house to ever serve class III beer in Finland welcomed the detachment with open arms for the fourth time. Ltn Psykoisi was awarded with 3. lk Vapaudenristi (VR3). Ltn Psykoisi's skill and determination combined with his dedication rank him among the best leaders of all time in the detachment and have profoundly affected the way LDDK has evolved over the years. Charlie Frank, Broileri, Psykoisi, Wolfskin, Kuokkanen, Night, Raunhofer, CZ, Jarger, Rölli, Ukkapukka, Pete, Luftwaffen, Scottz and Strat were awarded with Talkootyön Ansiomitali (TA) for participating in the squad meeting. Also Scottz has joined the Detachment. Welcome! Strat has been recruited to LDDK. Welcome! LDDK wishes everyone a very Happy New Year 2012!